Today, almost half of all antibiotic prescriptions written for children are for ear infections, and the cost of treating middle ear infections in the U.S. has been estimated at more than $2 billion a year. Untreated, ear infections can lead to more serious complications, including mastoiditis (a rare inflammation of a bone adjacent to the ear), hearing loss, perforation of the eardrum, meningitis, facial nerve paralysis, and possibly -- in adults -- Meniere's disease. In children and infants, the Eustachian tube is often too soft or immature and has a harder time staying open. 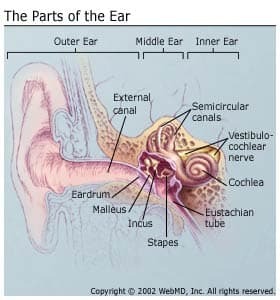 Allergies, post nasal drainage, sinus infections, common cold viruses and adenoid problems can all interfere with the Eustachian tube’s ability to let air pass into the middle ear. When the doctor looks at the eardrum, he or she will see that it is red, often bulging, and be able to make the diagnosis of an ear infection. For children, the most common trigger of an ear infection is an upper respiratory viral infection, such as a cold or the flu. These disorders can make the Eustachian tube so swollen that air can no longer flow into the middle ear. Allergies -- to pollen, dust, animal dander, or food -- can produce the same effect as a cold or flu, as can smoke, fumes, and other environmental toxins. Bacteria can cause an ear infection directly, but usually these organisms come on the heels of a viral infection or an allergic reaction, quickly finding their way into the warm, moist environment of the middle ear. Invading bacteria can wreak major havoc, turning inflammation into infection and provoking fevers. Among the bacteria most often found in infected middle ears are the same varieties responsible for many cases of sinusitis, pneumonia, and other respiratory infections. According to the American Academy of Otolaryngology-Head and Neck Surgery (ear, nose, and throat physicians), the conjugate pneumococcal vaccine is very effective against several strains of the most common bacteria that cause ear infections. This vaccine is routinely given to infants and toddlers to prevent meningitis, pneumonia, and blood infections. Your child’s doctor should advise you on the use of this vaccine, which may help to prevent at least some ear infections. Ear infections occur in various patterns. A single, isolated case is called an acute ear infection (acute otitis media). If the condition clears up but comes back as many as three times in a 6-month period (or four times in a single year), the person is said to have recurrent ear infections (recurrent acute otitis media). This usually indicates the Eustachian tube isn't working well. A fluid buildup in the middle ear without infection is termed otitis media with effusion, a condition where fluid stays in the ear because it is not well ventilated, but germs have not started to grow.